I am a huge fan of ornamental grasses, and I've written before about their uses and a few of my perennial favorites, so I'll try not to cover the same ground in this post. It does bear repeating, though, that grasses are vastly underused in most gardens, and I think that's a shame, because they give you so much for very little investment of time and money. There is such variety in size, shape, and color that grasses can serve almost any role in the garden, and they provide year-round interest, from the brightest greens of early summer to yellows, oranges and even reds as the weather cools, colors that will brighten the winter landscape clear through until spring, when new growth starts again. 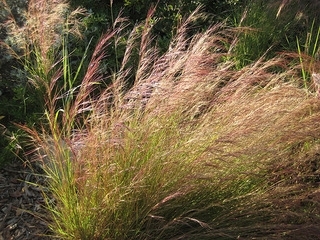 Below are a few suggestions for using grasses in your garden. Next time I'll share a few more of my favorites and some good websites for learning about and shopping for grasses. Apply liberally No matter what their size, grasses look better when they are planted in groups of at least three, and more is generally better. Consider a mass planting, where the grasses are a beautiful stage upon which your flowers perform as the season progresses. Even when your Salvia greggii fades and your Gaillardia dies back to the ground, the subdued autumn shades and graceful forms of your grasses will provide cool-season interest. Don't cut back until spring Winter is when the grasses really prove their worth in their landscape (as well as seeds for birds). Don't cut them back in the fall and lose out on all that beauty. Grasses are generally classified as cool-season or warm-season varieties, and cleaning them up varies a bit from species to species, but there's no reason to cut them back until the end of winter when new growth begins to appear. There's one for every spot True grasses are in the family Poaceae, many of which are drought-tolerant, but there are plenty that like regular watering, and if that doesn't provide enough options for you, consider sedges or rushes, grass look-alikes that generally like moister, shadier conditions. And from the smallest blue fescue to our own towering Great Basin wild rye, there's a size for every purpose. Shop around Local nurseries can provide many choices, but if, like me, you really get into grasses, you're always going to be on the lookout for something new! Love that ‘Morning Light' maiden grass (Miscanthus sinensis ‘Morning Light') you bought at the nursery? There are literally dozens of varieties and cultivars of that species, so there's probably another one you'd like even better that you may not be able to find easily. 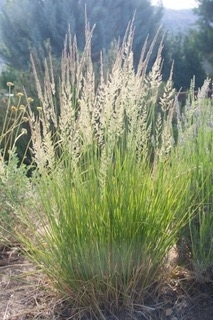 Grow your own While nearly any nursery will have a few Pennisetum and Panicum grasses, you'll probably never find plants of some of my favorites like purple three-awn (Aristida purpurea) or silver beardgrass (Bothriochloa laguroides). Fortunately, these and many other grasses are easily grown from seed. That's generally a desirable trait, but given sufficient water, some grasses will reseed aggressively in your garden. Mexican feather grass (Nassella tenuissima) is one I don't recommend for that reason. Purple three-awn isn't quite as prolific, the new seedlings are easy to remove, and sometimes they pop up in a location you didn't previously recognize as just the perfect spot.